Sculpt Nouveau Metal Cleaner - Sculpt Nouveau's Metal Degreaser and Descaler has been specially developed for the rapid and complete removal of rust, dirt, oil, grease, and scale from most metal surfaces in preparation for finish applications. This ready-to-use formula removes oxidation quickly and efficiently without leaving any residue or buildup that would prevent finish adhesion. 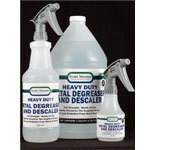 Additionally, the Metal Degreaser and Descaler contains corrosion inhibitors that protect the metal surface during cleaning. 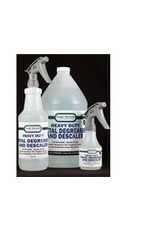 The Metal Degreaser and Descaler is not a polish and will remove the finish on polished and plated surfaces. It is available in 8oz., 32oz., and 1 gal. sizes. The 8oz. and 32oz. sizes include a spray top. All 3 pictured, each sold separately.